A brief history of attempts to use radio in the search for extraterrestrial civilizations. In 1894 Percival Lowell with his 450mm refractor telescope near Flagstaff Arizona described a network of canals which he believed he could see and which he felt was a clear sign of intelligent life on the planet Mars. And with H. G. Wells The War of the Worlds published shortly after it was easy for the general population to believe that an intelligent and possibly even hostile alien civilization existed on the relatively near by red planet. By the mid twentieth century while there was still optimistic hope that there may be some kind of life on Mars, as Mars is the most Earth like planet in the Solar System it was clearly not a highly developed life and not an extraterrestrial civilization! If there is no other intelligent life on Mars and by extension within our Solar System perhaps with there being somewhere between 200 to 400 billion stars in our Milky Way galaxy alone and perhaps with a large percentage of these stars having planetary systems and with the possibility of even a very small percentage of these planets harbouring life, it is easy to imagine the possibility of thousands of highly developed civilizations out there. It was clear from the start that we or they would find it near to technically impossible to physically travel the enormous distance too or from even the nearest stars. With nearest star to earth being the faint Proxima Centauri at a distance of 4.3 light-years and a light-year translating into about 9,460,000,000,000 kilometres, we will without some fundamental break through in technology never traverse these distances physically. The obvious choice was not to go there personally, but instead send or listen for a message from the distant civilizations. With the refinements in radio technology in particular sensitive VHF and microwave technology developed for radar during World War II we had a method. Astronomer Frank Drake penned an equation in 1960 as part of his preparation for what was known as the Green Bank meeting: that established SETI (Search for Extraterrestrial Intelligence). The equation aimed to get handle on the odd of there being extraterrestrial civilizations within our galaxy and to create some order to the issues that needed to be discussed at the conference. The equation has since taken on a life of its own and is quoted in most books and web sites on the subject and is the corner stone of much scientific discussion within SETI. is the number of civilizations in our galaxy that may be capable of contact. is the average rate of star formation in our galaxy. is the fraction of the above that actually go on to develop life at some point. is the fraction of the above that actually go on to develop intelligent life. is the length of time such a civilization emits detectable signals into space. There is obviously great debate over what values should be place in the equation as perhaps only and can be estimated on the bases of real scientific observational data. The galaxy is still big place and most or all of the 10 may still be well out of radio range. The bottom line is that most of the numbers are little more than a guess and you can get all sorts of results from less than 1 to thousands subject to what you think the values could be. We are certain that the number should be at least one! The most recent guestimation has produced a result of two. Them and us would you believe! The radio spectrum is enormous if you are aiming to detect a very weak and very narrow band signal. Nature has determined that a band of frequencies from just above 1000MHz to about 10,000MHz is galatically quiet and that atmospheric absorption is low, this is the terrestrial microwave window. This is also still a large amount of spectrum that is also increasing be used for all sorts of human communications from mobile phones to wireless broadband etc. A frequency known as the hydrogen line at 1420.40575 MHz has been chosen as it is a frequency or call channel that is universal and would be known by any technically advanced civilization. It is for this reason that the frequency range from 1400.00MHz to 1427.00MHz have been assigned exclusively to radio astronomy and no other activity is allowed. In April 1960 astronomer Frank Drake performed one of the first modern experiments named "Project Ozma" used a 25-meter-diameter radio telescope at Green Bank, West Virginia , to examine a small number of stars near the 1.420 gigahertz marker frequency. A 400 kilohertz band pass was scanned around the marker frequency, using a single-channel receiver with a bandwidth of 100 hertz. The information was stored on tape for off-line analysis. He found nothing of interest. A few years later during 1967 a large radio telescope was conducting experimental observation at 81MHz of the effects of the Sun's solar wind on distant Quasar radio sources. An odd radio signal was identified and when plotted on a chart recorder revealing a continuous series of pulses spaced perfectly every 1.337 seconds. The signal was confirmed as coming from deep space, but nothing like this had been seen before. It had to be seriously considered as a message or perhaps an extraterrestrial beacon. The signal was labeled LGM1 which stood for "Little Green Men" first contact. Evidence including the fact that there was no Doppler shift that would have be expected if the signal was coming from a planet of satellite orbiting a distant star. The source was in fact coming from a star its self, a rapidly rotating neutron star. A neutron star is the remnant core of supernova, an exploding giant star. As the star explodes throwing of massive amounts of material the core is driven inward along with the collapse of the remaining star material. A super dense object only several tens of km in diameter remains. As a result the object spins up and can be rotating as much 50 times a second. The highly compressed magnetic fields produced by the neutron star channels light and radio waves like a rotating search light. These object tuned out not to be an extraterrestrial radio beacon, but rather the discovery of one of natures strangest objects, the Pulsar. Over a thousand Pulsars have now been identified. On 15 August 1977 Dr Jerry Ehman a project volunteer for the Ohio State University SETI project witnessed a startlingly strong signal from the radio telescope. He circled the characters on the printout and scribbled "Wow" in the margin. This lone signal is considered by some as the most likely detection of an extraterrestrial signal ever received, but has not been detected again. The circled character code on the print 6EQUJ5 represents the amplitude variation of the signal. A space denotes amplitudes of between 0 and 0.999; the number 1 denotes the amplitude between 1 and 1.999, 2 represents 2 - 2.999 and so on. 10 and above are represented by letters, 10 - 10.999 is displayed as A, 11 - 11.999 is displayed B etc. The value of 'U' representing an intensity of between 30.0 and 30.999 and was the highest value recorded. The intensity is a representation of the signal to general background noise. The columns in the print out correspond to 10kHz-wide channels starting with channel 1 to the left and channel 2 with the signal of interest. The general frequency is around 1420.405MHz known as the hydrogen line. I have plotted the values on the below graph to give a clearer view of the rise and fall of the signal. Ohio State University's radio telescope known as Big Ear was a fixed antenna and used the Earths rotation to scan the sky. The beam width of the antenna and the rotation of the Earth meant that the Big Ear could observe a given point in the sky for only 72 seconds. An extraterrestrial signal would therefore be expected last for exactly 72 seconds and peak after 36 seconds as the signal past over the antenna's window and would then decay over the remaining 36 seconds. While the WOW signal may have been an Earth-bound signal that simply got reflected off a piece of space junk the duration and shape of the signal and the fact that it was narrow band corresponds to what would be expected of a signal of extraterrestrial origin. The case for the WOW signal being real! The 1420.405MHz channel falls within the 1400-1427MHz protected allocation for radio astronomy and should therefore be free of transmissions. Unless it was a fairly high orbiting piece of space junk the WOW signal should have had a different duration. Longer if the piece of space junk was tracking with the rotation of the earth or shorter if it were tracking in most other directions with relation to the rotation of the earth. I have not been able to find any reports of checks for known space junk orbits, however as NORAD (North American Aerospace Defence Command) actively tracks tens of thousands of these objects I would have assumed that this would have been a relatively easy task. It all hangs on this; the signal duration implies that it came from space well beyond earth. The signal was very narrow band implying that it was artificial. That's it! The case for doubt for the WOW signal! The two issues that cast serious doubt on the WOW signal are first that despite being relatively strong it has never been heard of again. Second and perhaps more serious is this; the Ohio State radio telescope uses two focal points, situated side by side. Any cosmic radio source would be seen first by one for 72 seconds and then about three minutes later by the other for a period of 72 seconds. The WOW signal produced a whopping 60 Jansky signal level on the first antenna, but was not detected by the second. While it is possible that the signal simply went off the air within the 3 minute period, this would have to seem bloody unlucky to say the least, but it is possible. Incredibly the WOW signal is after nearly 50 years of listening, the most tantalizingly possible signal heard thus far. Every hour of every day for more than half a century human civilization has been accidentally sending highly visible radio signals into space. From the viewpoint of a distant extraterrestrial observer the rotating Earth radiates bright pulses of electromagnetic energy across the radio spectrum. The flashes of radio emissions are a result of the rising and setting of hundreds of powerful radio stations, television transmitters, microwave links etc peppered around the globe. Although these transmitters generally radiate parallel to the surface of the Earth as these signals pass beyond the horizon they ultimately radiate out into the cosmos. In fact so much radiation is now leaking of into space that the Earth is near as an intense a radio source as the Sun. Therefore if anyone is listening for as far as 50 light-years from us, they already know what we're up to. The big question is will our new space friends interpret Big Brother as a sign of intelligent life? A more conscious effort was made in the 1970s with the launched four probes by the United States to survey the outer planets of the Solar System with a trajectory that has destined them to leave the Solar System and sail out amongst the stars for the rest of eternity. More an act of faith and symbolism the spacecraft have plaques that if found would communicate something about us to the finder. There was at the time some controversy about the information contained in the plaques as it depicted were we are, the fear was that if found something, possibly hostile would be able to locate us. The probes Pioneer 10 and 11 probes launched in 1972 and 1973 carried a plaque depicting the location of the Earth and solar system within the galaxy and the form of the human body. 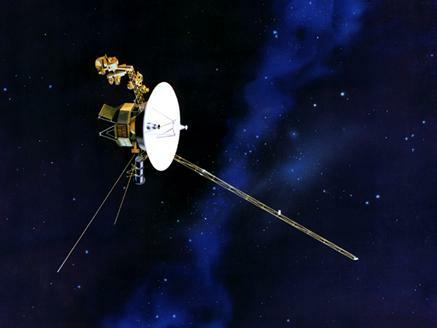 The Voyager 1 and 2 probes launched in 1977 carry two gold records that depict again the human form, our solar system and its location and also included are recordings of pictures and sounds from Earth. Something to ponder is this; long after the human race is gone and the Earth its self is dead and lifeless these probes could be the longest lived indication that we ever existed. As every amateur knows, if every one is just listing potentially good DX contacts will go unrealized, therefore in 1974 the Arecibo radio telescope, the largest radio telescopes in the world transmitted a series of messages in the form of digital images. The Arecibo message was a 1679 pixel image with 73 rows and 23 columns. It shows the numbers one through ten, the atomic numbers of hydrogen, carbon, nitrogen, oxygen, and phosphorus, a figure of a human being and its height, the population of Earth, our solar system, and an image of the Arecibo telescope with its diameter. At present the SETI Institute a now privately funded organization has been focusing on a joint project with University of California Berkeley to building a SETI-dedicated array of telescopes that will equal a 100-meter radio telescope, the Allen Telescope Array. It is the forerunner of other larger radio astronomy arrays planned for later in the decade. It is possible that as the telescope and SETI technology advances we may be able to detect intelligence not by directed message but by the same kind of 'noise' we accidentally broadcast to the cosmos via radio, television and radar signals. It is likely that SETI and the like is a waist of money and effort as the current best technology at our disposal requires that the signal be in cosmic terms very close, say 100 light-years at a stretch. This is only covering about 0.1% of our Milky Way galaxy. Remember the Drake equation that estimates between two and ten possible extraterrestrial civilizations within our entire galaxy. The odds are really stacked against success. However the implications of an extraterrestrial contact on human culture and the way we see ourselve would be profound. Imagine if we were able to establish ongo radio contact with an extraterrestrial civilization 20 light-years away. Think about it, it would change everything!